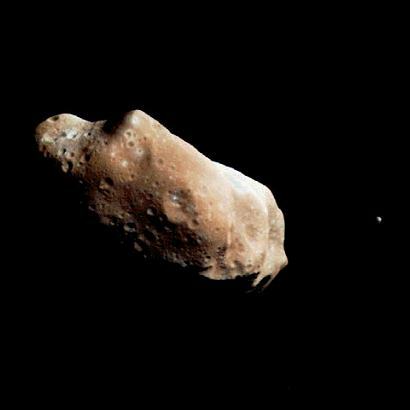 Ida is the second asteroid ever encountered by a spacecraft. It is more than twice as large as Gaspra, the first asteroid observed by Galileo in October 1991. Ida is an irregularly shaped asteroid placed by scientists in the S class (believed to be like stony or stony- iron meteorites). It is a member of the Koronis family, presumed fragments left from the breakup of a larger asteroid in a catastrophic collision. As the Koronis family is still closely grouped, scientists initially assumed that Ida was a relatively young asteroid, with a "youthful" surface. This view shows numerous craters, including many degraded craters larger than any seen on Gaspra. The extensive cratering seems to dispel theories about Ida's surface being geologically youthful (in which case there would have been relatively few craters). This view also seems to rule out the idea that Ida is a double body. The south pole is in the dark side of this image near the middle of the asteroid. Ida has its own moon named Dactyl. From this view Dactyl can be seen in the distance.